Congratulations on your new sale! Richard Love love love it takes me home to england at this time of the year .Congrats on your sale!!! Congrats, this is awesome! I love it! Well done, congrats on your sale! 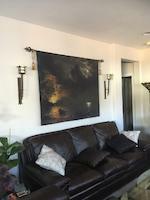 Richard, Sharing my Congratulations on your recent Feature in Wisconsin Flower and Scenery ! I really appreciate the honours that you have awarded my work, Randy. Thank you! You are very kind Nava! Similar to an old baker's wagon we use to have. Great picture. A great and classic deisgn! This is simply amazing. What talent. This is a holiday card for sure. Congrats on your sale. Thank you Myrna! 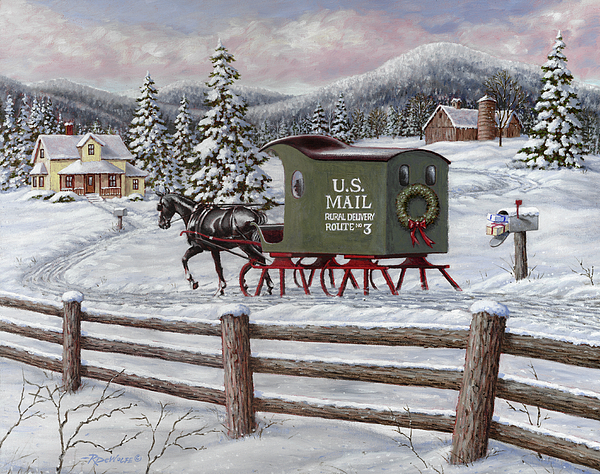 I enjoy painting nostalgic Christmas scenes. Imagine a time before FedEx and jet airplanes. 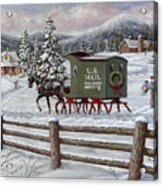 Life was a lot slower then, and for many people living in rural areas, the most exciting event of the day was a visit by the mailman. A card, a letter or a parcel from some far away friend or relative was something to cherish and look forward to. Expectations must have soared at Christmas time each year! 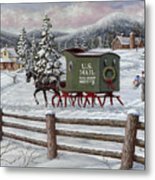 Getting the mail to all of these people was especially difficult in winter. 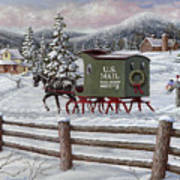 Mail delivery wagons would have to be refitted with sleighs in place of wheels in order to travel the snow-covered roads. The mailman would sit in an open and unheated seat all day long making sure that the mail got through to those who waited to see him come. Merry Christmas!